“Mac-Lander trailers have been a tremendous asset to our business. Consistent quality, as well as continuous improvements to each product line, result in satisfied AND repeat customers. 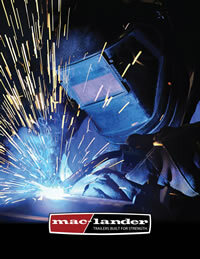 With excellent service and support from the factory, we sell every Mac-Lander Trailer with confidence. In 1998, we took an aggressive approach to offering our customers a quality choice in trailers when we increased our inventory of Mac-Lander trailers. It has been a great success. In just nine months we have increased sales 77 percent over the whole previous year. We find the way to sell a Mac-Lander trailer is simple: have it in stock, it sells! We encourage you to contact us with your comments.